Long out of print, the second novel by the bestselling author of A Wrinkle in Time looks at the darker side of love in a Southern town. From the moment Henry Porcher first sees Ilsa Brandes, he worships her. Despite controversy surrounding the young girl, Henry is drawn to her, a fascination that turns into a lifelong infatuation. As the years pass, Ilsa’s memory never leaves him, not until the day he returns to their sleepy Southern hometown and renews their childhood friendship. Henry watches as she becomes a wife, then a mother, then a widow, irrevocably changed by tragedy. Out of print for nearly six decades, this rare and sought-after novel is a portrait of a remarkable woman bound by both the stifling conventions of her time and place, and her own sense of honor and purpose. 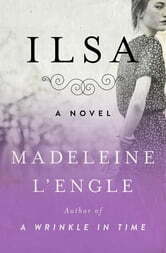 A departure from L’Engle’s later works, Ilsa is a dark, intriguing novel about passion, fixation, and the real price of unrequited love by an author renowned for her children’s classics as well as her candid personal memoirs. This ebook features an illustrated biography of Madeleine L’Engle including rare images from the author’s estate. The story seemed to ramble on and on and I was just glad to reach the end, even though that too was disappointing. The author spent a lot of time describing the scenery and surroundings, but not much on giving insight into why the characters thought and acted as they did. A Wrinke in Time is one of my all time favorite books. I cant believe this was written by the same author. It just rambled on and on with no real direction. So disappointed. The story was interesting enough however the editing was possibly the worst I have encountered. The misspelled words destroyed the flow of the story. This problem may have been caused by character recognition when transferring the script from book to epub but the editor/publisher need to take full responsibility for the many errors.